To meet the needs of growers looking for increased efficiency and productivity, Case IH’s Continuously Variable Transmission (CVT) is now available as an option on the Puma 165, 180, 195 and 210 tractor models. The CVT introduction also includes a new range-topping model, the Puma 225. For hay and haulage operations, the Puma Tractor’s Engine Power Boost, which provides additional engine power of up to 37 Hp for demanding implements, comes into its own. The APM, which adjusts engine and transmission ratio automatically for fuel efficiency or productivity, makes it ideal for use in broadacre and spray operations. Hay baling operations also benefit from the Puma’s Active Stop Control feature which allows for easier stops and starts on inclines, without the need for clutching and breaking. The new Puma 225 Tractors have a maximum engine power of 185 kW (251 hp) available during PTO, transport and demanding hydraulic operations. “We recently added a standard feature on virtually all Puma models that allows engine power boost with hydraulic operations. This makes the Puma ideal for use with hydraulically driven boom sprayers where maintaining productivity and a constant flow rate is key,” John said. Serviceability has also been considered, with the new CVT transmission retaining the time-proven cartridge design, which allows part of the transmission to be removed without pulling the tractor apart. “This feature may save a huge amount of service time and money over the life of the tractor,” John added. The Puma tractor range also includes an all-new Case IH Multicontrol Armrest which allows operators to control all speed, direction, hydraulic hitch and end-of-row functions from one simple, intuitive multifunction control handle. The Multicontrol Armrest eliminates the need for a right side control console, increasing seat range motion and right side visibility. For further ease of operation, an electronic joystick can be integrated into the armrest, allowing simultaneous control of optional third mid-mount functions. Powered by the proven and quiet Case IH 6 cylinder, 6.75 L engine, the Puma is compatible for use with up to a 100 per cent biodiesel blend (following approved Case IH maintenance procedures). 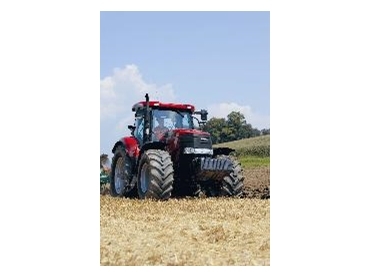 All models are available with optional AFS AccuGuide Ready option to allow farmers to take advantage of Case IH Advanced Farming System precision farming capabilities.